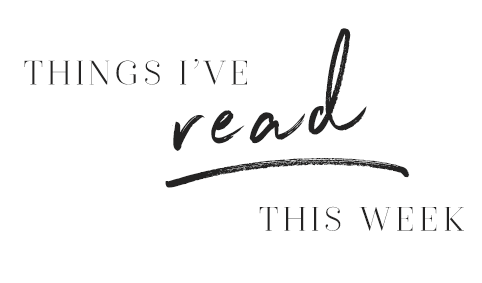 Welcome to my weekly digest, covering things I’ve been reading, and interesting fact, my favourite posts on Instagram (including one this week that makes me so freaking happy) and a few things I’ve spotted that are on my shopping list. I woke up this morning to some horrific news about the attack around London Bridge, and a number of missed calls from friends worried about me. I was absolutely fine; I came back from a wonderful BBQ at about 8pm, and ended up having an early night – luckily I’m an old granny so Saturday nights for me are all about pyjamas, Dr Who, and 11-hours of sleep. It was definitely plausible that it could have been me sitting in one of those bars along Borough High Street though, so I appreciate every single worried message and phone call I had, even if I didn’t reply until I finally woke up at around 10am. Once again, we’ve been targeted by individuals who feel entitled to the lives of other people. My heart goes out to all those affected – a few friends had near-misses in the area, and a number of my loved ones had stories of other friends who were trapped inside pubs as the police shouted “get down” to them, other who were told by taxi drivers to keep clear of the area, and others who ended up walking/running quite far to get a train home. This is terrifyingly close to home for me, but I am warmed by how much people seem to care about each other, and the way that we once again demonstrate that London’s spirit will not be broken. Moving on to something a bit happier, I hope those of you who were lucky enough to experience a bank holiday last weekend had a lovely one. I spent two out of three days decorating my office, which was enormous fun. Having painted it all an expensive paint from Dulux (not to be confused with Durex) which cost me £53 a tin (yikes! It’s supposed to ‘disperse light’ or something, so I can only expect that the light reflecting fragments are made from pure gold) I decided to roll up my sleeves and do something potentially very destructive. I grabbed some random paint (and makeup) brushes, and some grey paint…and I started to daub some random blobs all over my wall. A part of me was panicking about how terrible this could have gone, but when I stood back (into the newly painted wall on the other side of the room, sigh) …actually, it looked dead good. Like, really good. I’ve been sharing some of my painting experience on Instagram this week, so I’m sorry for the DIY spam. I’ve been trying to watch the pennies this month, so it’s no surprise that it’s May when I get accidentally overcharged for things, or that it just so happens that my 2-year domain name payments come out this month and I’d forgotten about them. Luckily, I had the foresight to eBay a few things last week, so I can just about cover everything. I hope. Dummy Alert: A short time ago, I spent an agonising ten minutes with a friend trying to name the ‘seven seas’. I was sure that, during a pub quiz a few years ago, they’d asked us to name the seven seas. Perhaps what they may have asked was ‘name seven seas’, meaning, name only seven of the numerous seas. Foolishly I came away thinking that there were only seven seas, and this has caused some confusion over the years when I could count more than seven. Was it that some seas weren’t actually seas? I could name the North, the Bering, the Caspian, the Aegean, the Yellow, the Irish, the Mediterranean…wait, is that one? How about the Arabian Sea, or the Sulu? Yeah, it turns out that I was completely wrong, and I’m an idiot. Obviously the above are all seas, and there are also no fewer than 70 different bodies of water called ‘seas’. So much for seven. Okay, so if seas and oceans are different, what’s so special about these seven seas? What’s wrong with the other sixty or so seas? Bonus fact: the ‘world ocean’ (which comprises of all the interconnecting bodies of water in the hydrosphere, yes, hydrosphere) is colloquially referred to as ‘the sea’, which means that there is one sea, but also 70 smaller seas. Confused yet? Let’s talk about the word ‘hydrosphere’. I have this cut in the Laneway print, which is a gorgeous orange and blue, but I’ve been eyeing up the red and blue colours, as the thin stripe is PERFECT for summer! I’m feeling straw-hat and ice cream vibes with this dress. It retails at £39.99 (so cheap!) and at the moment Tiger Milly have it available in both colours, and new customers get 10% off, which is awesome! Sadly the sizes are limited to 8-16. Last week Lady Vintage released an epic PANDA print (I KNOW!!!) which frustratingly sold out in my size almost immediately, and THIS week they’ve launched Nancy (also sold out in my size, arghhh!) 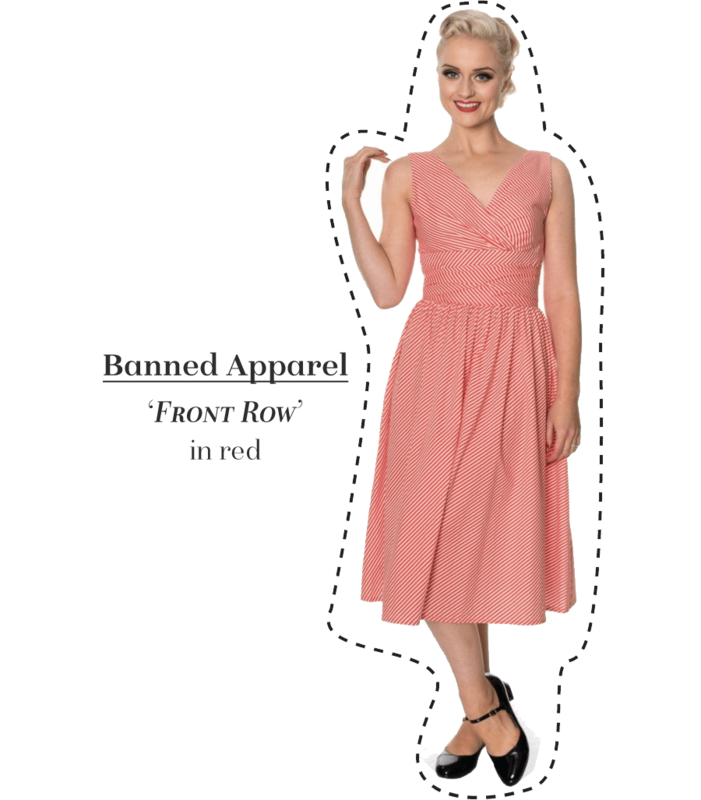 which is this gorgeous sleeveless dress, with built-in petticoat. And in a cat print!! It’s so adorable! ‘Nancy’ in ‘Fantastic Cats’ is available in sizes 8-22, and there are a few sizes still available on their website.